"I support policies, ideas & initiatives that deliver responsive, effective government for every citizen. I'm on a lifelong campaign for good government." 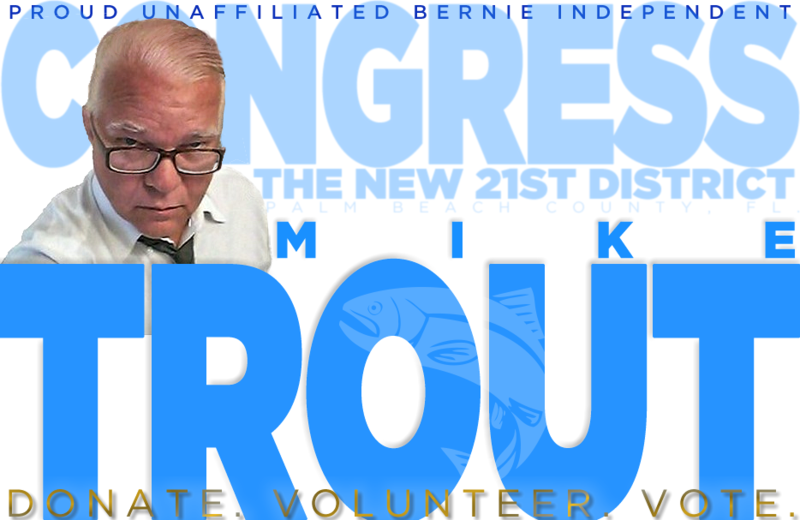 W. Michael (Mike) Trout, born 1958 in Ancon, Panama Canal Zone (Running in the NEW 21st Congressional District.) :: I first moved to Boca Raton for a job as pianist in the old Burdines in Town Center Mall, in 1989. Burdines went into bankruptcy shortly after, and I went to work performing in J Calloway's Christmas Stores, both in Boca Town Center Mall, and Boynton Beach Mall. After that, I moved to Costa Rica through part of 1991. When I returned, I was drawn to (now) Governor Jerry Brown's (CA) presidential campaign, and was hired over the phone to join the effort. I became Office Manager at our National Campaign Headquarters in Santa Monica, also participating in the Latino outreach, working in the California campaign, and wound up finally a Brown Delegate to the Democratic National Convention at Madison Square Garden in New York City in the summer of 1992. Ours was the first national campaign to use the internet widely. I served on the Board of Directors of the Central Florida Community Development Corporation (CFCDC), a nonprofit agency focused on economic development in blighted and underserved areas, operating with funding partly from the Community Block Grants program in Daytona Beach, Fl. ​In 2012, with little money and nothing but a strong message of campaign finance reform, consumer and constituent advocacy, I ran for this same office. I was proud to demonstrate that a campaign didn't have to be about big money donors, and that voters responded favorably to a candidate who cares about restoring an even playing field for Americans in and out of my district. We brought together nearly 40,000 voters at the ballot box. "They say it takes a good follower to be a good leader. Bernie has led the revolution to within steps of the White House, and has asked us to join him in endorsing Hillary Clinton for President of the United States. I will follow my 2016 leader, and without surrendering my Progressive principles, I hereby endorse Hillary Clinton for President. Our revolution continues -- the people have voted for 260 "BernieCrats" SO FAR, in Primary Elections across the country. If these candidates prevail in the General Election, we CAN effect dramatic change for the people. In the upcoming Primary elections, please support Progressive Berniecrat candidates, whenever possible."